The Acapulco Chair has its origins in Mid Century Mexico and is a classic designer indoor/outdoor chair. Designer chairs often cost a mint, so where to find the Acapulco chair cheap? Fortunately, there are several replicas available that bring the swagger and fun style of the classic Acapulco chair into the new Millennium! In this article, we review these chairs and also have a buyers guide that covers several of the major considerations when shopping for Acapulco chairs. If we had to choose a favorite, we would choose the Design Tree Home Acapulco chair. It hits the best price point for its size, features, and weight capacity. For a full review of this chair, please see below. 1 The Acapulco Chair, a Super Cool Mid-Century Chair! 6 How Much Does a Typical Acapulco Chair Cost? 7 Where Can Acapulco Chairs Be Purchased Online? The Acapulco Chair, a Super Cool Mid-Century Chair! Unlike most iconic Mid Century Modern furniture pieces, it is unclear who the original inventor of the Acapulco chair is! The original Acapulco chair was apparently inspired by woven open cord Mayan-style hammocks, and was brought to fame during Acapulco’s heyday in the 1950s. Movie stars like Elvis Presley and politicians like the Kennedys flocked to stylish, fun Acapulco for getaways, and brought back the Acapulco chair from their vacations. Due to technological innovations, replicas of these chairs tend to use more weather-resistant materials than the original chairs had, and are often more robust than the originals. Designers have riffed on the original concept, and interesting new options like the Baby Acapulco Chair are now being produced. In this section, we look at four great options for replica Acapulco indoor/outdoor chairs. We’ll start with a comparison table, and then look individually at each chair. To conclude, we’ll go over a buyer’s guide that looks at the history, design, and common features of these chairs. Be sure to check out our Patio Furniture Deals to see if any of these chairs are currently on sale around the web! Design Tree Home makes their Acapulco chair in several fun color choices, though all of their frames are made of black powder coated steel. These chairs are cool, fun, and will work excellently both as indoor chairs and as outdoor chairs. The Design Tree Home Acapulco Chair has a pleasing avocado shaped design, and is quite comfortable to sit on. There is a fairly significant contour to the chair, so users will need lean back a bit when sitting in these stylish modern replica chairs. This chair is definitely a lounge chair, as opposed to a side chair or arm chair. These chairs are hand-woven with PE vinyl cords, and are pretty durable both indoors and out. They won’t stay water-logged if they get wet, but ideally they should be covered or taken inside when the rain comes. The fabric is fairly high quality, but persistent water and solar exposure will degrade it. Assembly is fairly simple, and takes about 10 minutes with no unusual tools required. You’ll be lounging in style in no time! For its relatively inexpensive price point, the Design Tree Home replica Acapulco Chair is a nicely made chair that will look great both indoors and outdoors. It is fairly easy to assemble, and will look super stylish for years if properly cared for. INDOOR/OUTDOOR: These chairs are functional both as indoor and outdoor loungers. UV protected vinyl cord stops color from fading. Rust resistant iron keeps everything working smoothly. Joseph Allen’s Acapulco chair line features few colors, but they are available in a sharp white powder coated steel frame that really looks nice against dark colored vinyl cords. Inspired by Mayan woven hammocks, these chairs are stylish, elegant, and will look great on the patio and in the living room! 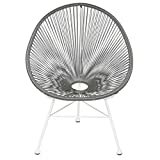 The Joseph Allen Acapulco chair replica design is made of stainless steel, and is one of the lighter chairs on our list. This is good, in that this chair is easy to move from the outdoors to the indoors. It has an oval-to-Avocado shaped design, and are relatively tall and narrow. You still lounge back fairly significantly in these chairs, but not as much as in some of the other Acapulco patio chairs on our list. These chairs are available in three weave colors: gray, red, and yellow. We really like the white powder coat finish, as it adds a nice dimension to the chair. Joseph Allen also makes other formats, like Acapulco Rocking Chairs, as well. The cords are made of PE-vinyl, and are water-resistant and UV protected. You should be able to leave this out in the sun, but we still recommend covering or bringing the chairs inside when not in use. This will only increase the longevity of these cheap Acapulco chairs. Assembly is quick, as the chair is light and pretty easy to deal with. The 300 lb weight limit is a bit lower than some of the other chairs on our list, so if you have guests that are on the heftier side, you may want to shy away from this version of the Acapulco chair. 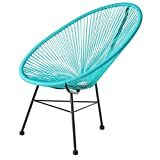 Positioned at an aggressive price point, and constructed with a light steel frame, the Joseph Allen replica Acapulco wire basket lounge chair is an excellent choice for those looking for a durable, stylish indoor/outdoor chair. The color selection is not the best, but is fine given the price these chairs are positioned. To get a complete picture on price, be sure you check the price on Wayfair as well! Receive Coupons for life for future purchases on any product in our store! The PolyVaz Mayan Hammock Acapulco Chair is a cool retro-Modern chair with some great color choices. These chairs will look great both indoors and outdoors, and will have you lounging in style! 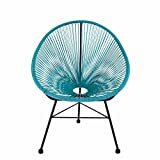 The PoliVaz Mayan Hammock Acapulco Chair Replica is one of the larger replica chairs on our list, and is constructed of cast iron with a powder coat. The iron is surprisingly light, and is pretty comparable to steel. The cord is constructed of a UV-protected, hand woven PE Vinyl that is carefully wrapped for consistent strength throughout the chair. In terms of assembly, the base must be screwed onto the chair, which is not a difficult process. However, over time the provided screws may loosen up a bit, and give the chair a wobbly feel. Periodically check for tightness, and if necessary replace with better fasteners. The PoliVaz chair is a good budget Acapulco chair replica that can be used indoors and outdoors. It is nicely sized, and its iron frame is attractive. Given the price point, this is an excellent choice if the colors appeal to you, and if the size of the chair is appropriate for your needs. Be sure you check the price on Wayfair before you buy, to ensure you get the best deal! The Harmonia Living Acapulco Chair cheap designer replica is available in seven colors, and shines with style and fun. Blending mid century style with modern construction techniques, the Harmonia Living Acapulco chair is a great indoor/outdoor Acapulco chair. This Replica Acapulco Chair is straight out of a 50s Beach Blanket movie! The Harmonia Living Acapulco Chair is the widest chair on our list, and has one of the lowest back heights. This results in a fairly oval structure, though there’s still a bit of the Avocado shape peeking through. Constructed of steel, but with a surprising amount of heft, the Harmonia Living chair is comfortable, and is a nice blend between a lounge chair and a side chair. The cords or woven PE round vinyl fabric, and are quite resistant to sun and rain. We still encourage users to cover or otherwise protect these chairs when not in use; proper storage will almost always increase the life of outdoor furniture. The Harmonia Chair is stackable, which makes organization and storage much easier than for non-stackable chairs. One nice unique feature of this chair is the complete lack of assembly required. If you had to put furniture together, the Harmonia Living Chair may be the Acapulco chair for you. Handsome but on the relatively expensive side, the Harmonia Living Chairs are nice Acapulco chairs with high-quality steel construction and a comfortable design. That said, unless you absolutely love one of the colors of the Harmonia Living chair, you may want to choose one of the other chairs on this list for a cheaper price for similar quality. Acapulco chairs are classic modern indoor/outdoor lounge chairs with a great fun, elegant style. These chairs are one of the iconic outdoor furniture pieces of the last 100 years, and a pinnacle of mid Century design. Along with the Adirondack chair, the Acapulco chair is one of the few “named” styles of outdoor chair available. Like many classic chairs, it is possible to purchase an Acapulco chair replica or to find an original. But which the better choice? In this article, we will look at the Acapulco chair and consider whether it makes sense to search for an original or purchase a replica. Legend has it the Acapulco chair was developed by an unnamed French visitor to Acapulco in 1953, the height of Acapulco’s heyday as a destination for the global jet set. The unknown designer was apparently inspired by woven Mayan style hammocks frequently used in the area, and wanted the comfort of a Mayan hammock in a chair form. This design is perfectly suited for the warm, coastal weather of Acapulco, Mexico. The Acapulco chair is one of the few designer chairs that has no identified designer. Therefore, it is hard to purchase an “original” chair. There’s no Herman Miller to shop at to get the authentic Acapulco chair. If you want to purchase one, you can try to find a vintage chair, or purchase a replica or knock off. In the 1950s, Acapulco, Mexico, was one of the premier vacation spots for movie stars from Hollywood. With its gorgeous weather, stunning cliffs, beautiful resorts, and the cache of Hollywood royalty and high powered DC politicians visiting, this original Mexican resort city had it all. Located on the western coast of Mexico, in the state of Guerrero, Acapulco was a short flight from California, and an excellent opportunity for Californian to visit an exotic location not too far from home. Well known visitors were the Kennedys (who honeymooned there), Elvis Presley, Elizabeth Taylor (who got married there), Frank Sinatra, etc. When word got out that the stars were headed there, the exotic-sounding area became a hot travel destination overnight. Mexican politicians and wealthy landowners frequented the city, as did visitors from all over the world. With the commercialization of air travel over the previous 10 years, travel to exotic, beautiful Acapulco was not out of reach for many wealthy mid-Century Americans. Artists and designers were also drawn to Mexico’s first resort town, and out of this flourishing environment came the Acapulco chair, a triumph of fun and stylish design. 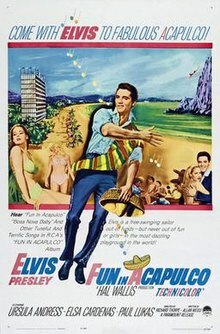 Hollywood used Acapulco as a backdrop for several films, including Elvis’ Fun in Acapulco (though Elvis wasn’t actually in Acapulco for the film). Gradually the city’s star faded and it was overrun with drug violence and crime waves. It is now recovering and is becoming a popular travel destination once again, with many hotels refurbished in order to blend the classic mid Century modern styling with contemporary tastes. Coming out of this fascinating time was the Acapulco chair, which rose to prominence in the 50s. The Acapulco chair consists of an oval metal frame with three legs and a sharp triangular base. The oval frame is the structure for a woven fabric system that ultimately creates the chair. It is a beautiful, ingenious support design that works great both outdoors and indoors. The frame is somewhat avocado or egg-shaped, and generally, the angle of the chair is such that users sink into the chair, and sit in a relaxed, lounge position. It is quite comfortable, and it blends the concept of a reclining lounge chair with a hammock. It is breathable, but sturdy, and looks stunning. Finding an original Acapulco chair is a difficult endeavor. The original chairs were often made with cotton fabric and wrought iron frames that were typically not powder coated for protection from the elements. Consequently, a lot of the original chairs likely rusted if they were used outside, and the fabric has almost certainly failed or has been replaced over the last 60 years. If you can find an original, shipping may be quite high as they were not designed to be disassembled for shipping. Also, if you do find one in great shape, you may not want to… well… sit on it. You may find that the cords are not as strong as they should be, and if the cords are replaced, do you really have an original anymore? All of this suggests that unless you are a collector or are interested in true vintage furniture no matter what the cost, perhaps a vintage Acapulco chair may not be your best option. Replica, or knock-off furniture, is controversial in the design community. While most patents have expired on mid-century furniture, there is a discomfort around depriving a designer of their work with a knock-off of questionable quality. However, in the case of the Acapulco chair, there is no clear original designer, and no company still makes “authentic” original Acapulco chairs. In fact, many artisans in the Acapulco area will make and sell Acapulco chairs relatively inexpensively, however, these are hard to find online. Some interesting new takes, such as rocking chair legs, love seat-designs, etc. How Much Does a Typical Acapulco Chair Cost? Typically a high-quality replica chair will go for between $200-500, depending on the design and manufacturer. 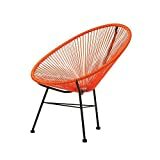 Where Can Acapulco Chairs Be Purchased Online? Amazon and Wayfair sell several different lines, as examined above. A lot of outdoor patio chairs look like… well… outdoor patio chairs. They aren’t given the same attention to detail that indoor chairs are given, or else they are made in large sets with a unity of design that doesn’t quite work inside. There is obviously plenty of high quality outdoor designer furniture out there, but one of the great aspects of the Acapulco chair is that it looks like it actually belongs both in an outdoor environment and an indoor environment. These chairs exude style no matter where they are! Also, by buying an Acapulco chair, you are purchasing both an indoor and an outdoor lounge chair, which is an added benefit! Most reproduction Acapulco chairs are constructed with a steel or iron frame. Steel and iron will rust if left outdoors, so unlike the original Acapulco chairs, most reproductions are painted with a powder coat for rust protection. Powder coated paint will help the chair resist rust and damage from outdoor exposure. That said, if the powder coat fails, the chair will rust, so one of the concerns with cheap Acapulco chairs is the quality of the powder coat. When possible, use a furniture cover or bring these chairs inside when not in use, as that will increase the longevity of the chair. Replica Acapulco Chairs are usually made with a Polyethylene (PE) vinyl cord structure. PE strapping is relatively outdoor-resistant and is a good choice for a chair. HDPE is better but typically is not seen on cheaper Acapulco Chairs. Regardless, PE strapping is typically UV and water resistant and is relatively durable outdoors or indoors. The ability to stack chairs for storage makes organizing patio furniture much easier. Stacked chairs are less likely to need to be weighted down, can be covered with a single furniture cover, and take up much less space than non-stacking chairs.